I'm a real fan of the cartoons starring Fog Horn, the Louis Armstrong-sound-a-like frog used in 5 cartoons by Harman and Ising. The only reason of interest for the majority of the Harman and Ising cartoons, for me, are the marvellous backgrounds as well as the animation. 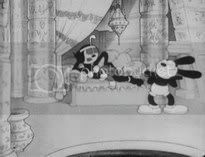 But these cartoons (the three ones with Bosko, "The Old Mill Pond" and "Swing Wedding") got everything: the above mentioned elements plus great gags and musical score. No matter if they are formulaic shorts( in each and every one of the Bokso cartoons the li'l black boy is given by a Mammy some cookies and he got to bring them to his Grandma. He then have dream-like adventures in which the frogs, caricatures of black entertainers of those days, try to get the cookies): the energy in them neveral fails to produce terrific entertaiment! Enjoy this restored copy of "Little Ol' Bosko in Bagdad" and let me know if you like it or not. this cartoon really impressed me. Its wonderful animated and somehow reminded me the Fleisher cartoons. I will keep digging information about these directors. Are these Bosko's in any DVD? I really would love to freeze some frames with a higher quality. Nope, these cartoons are not on DVD. I suggested a way to include them in one of the LTGCs (I know these to be MGM efforts). They could do it, in the future, down the road. Let's hope. When the peg comes up to camera it appears to go out of focus. Is this a real effect, or just an illusion due to the image compression?